The 14 room Copper Whale Inn is ideally located near Anchorage’s restaurants, galleries and museums, while still providing glimpses of Alaska’s celebrated scenery. With views across Cook Inlet to the Alaska Range, binoculars are available for guest use in the living room, helping to spot bald eagles, beluga whales and other wildlife. An historic building, the Inn’s main house was one of the few structures to survive the 1964 earthquake and is a stunning contrast to the high-rises in the nearby downtown. Perfectly situated for those who wish to explore the 11-mile Coastal Trail and with bicycle rental on site, there is plenty to do here and the innkeepers are happy to provide suggestions and advice on how to get the most out of your stay in Anchorage. Each room features a TV and phone, while the common area has a microwave, refrigerator, coffee service, wifi and laundry facilities. 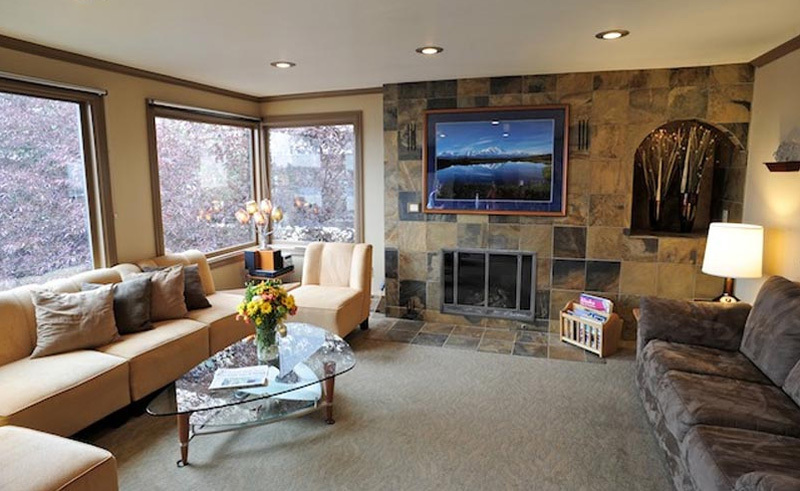 With a stone-trimmed fireplace warming the living room and lush gardens surrounding the property, the Copper Whale Inn is a relaxing respite for travellers to Anchorage. This 2-week itinerary takes in many of Alaska's best known highlights, such as, Denali and the Kenai Peninsula, staying in more intimate accommodation.